The Australian World Orchestra’s Chamber 8 – eight of Australia’s finest musicians on the international stage – will tour the country in July. 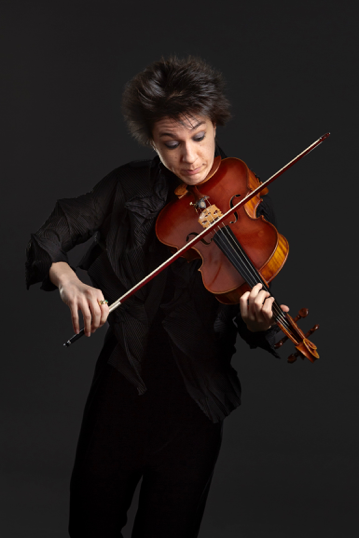 Violist Tahlia Petrosian is the fifth of the eight to answer Limelight‘s Eight for Chamber 8. What is your favourite piece of chamber music and why? That’s a difficult question to answer because ultimately all music-making is chamber music. By that I mean that even in a large symphonic orchestra one employs the same skills one needs to play in a string quartet – performing music in a group is a constant mediation between listening to the others and contributing one’s own voice. It is exactly like having a conversation. So, to answer this question I would have to look at all the works composed regardless of the size of the ensemble for which they were written and choose one! A further factor impacting my answer would be considering whether I would be listening to these works or performing them… but to simplify my answer I would say that, for the moment, my favourite piece of chamber music is Mendelssohn’s String Octet which I performed with colleagues together with Joshua Bell in December last year. It’s really a work where all the parts intertwine while, at the same time, each retains an individual voice. And the audience always loves to hear this work performed! Three little known works that deserve to be heard more often? Three of the most inspiring conductors you have ever played under? There are many great conductors who each bring something individual to the art of standing in front of and directing ninety or so musicians. Three of the most inspiring for me would be Herbert Blomstedt, Sir Simon Rattle and Andris Nelsons, but each for different reasons. Maestro Blomstedt has a very intellectual approach to a score and his amazing work ethic – at the age of 90! – is inspiring. Sir Simon is a wonderful communicator and, in a way, you have the feeling he is communicating with you directly in the orchestra and you forget you are only one of ninety! In this way, he definitely inspires you to give your best. Andris Nelsons, on the other hand, has a great gift for turning the music into large ‘sound pictures’. In the rehearsals, he’s always telling a story or describing a picture to explain the musical expression that he wishes us to convey, thereby inspiring us to aspire to an enormous breadth of musical expression through his use of visual allusions. What are the greatest pleasures to be had playing chamber music? The pleasures to be had playing chamber music parallel exactly those one enjoys in a great conversation with a number of individuals. Wit, intelligence, sarcasm, irony, profound insight – all of these characteristics and more are found in great conversations and in great chamber music-making. Naturally, one would point out that the difference between conversations and chamber music-making is that one doesn’t ‘rehearse’ conversations and there is no script (which one could say would be like the score). However, for me, chamber music rehearsals are the preparation for the finding of freedom for spontaneity in the actual performance – i.e. the rehearsals are to free the musicians from the score, not to bind us to it. In any case, the score is not the script of the conversation, it is simply an approximation of many of the composer’s ideas and it contains – at best – only an intimation of what the composer was thinking. Playing chamber music is a fantastic way to enjoy time with other musicians and also to get to know new musicians and to make new friends. Each musician speaks with his or her instrument and, at the conclusion of the music-making, as with a conversation, new friendships and understandings are formed between people – the only difference being that, with chamber music, this has been achieved with very few actual words having been spoken. Three clichés about classical musicians that annoy you the most? There are many clichés about classical musicians. Many are the result of stereotypes used in jokes and humorous anecdotes. They apply on many occasions to conductors, pianists and especially violists! What these clichés tell us is that classical musicians are eccentric, insecure, sometimes nerdy. But they don’t really annoy me because they are telling something about the struggles musicians have to go through in order to master their art. Having to focus on the demands of their instruments or the music they have to interpret can often make musicians seem distant or unusual. And, to achieve their level as a performer, classical musicians have to often endure long periods of financial struggle – with an instrument, paying for lessons, having a lack of material security. Often it takes a lifetime of struggle before one becomes an overnight sensation. So these clichés might irritate when the truth of what they are revealing is missed, but they are nevertheless valuable beacons bearing witness to the commitment and sacrifice required for the music we play and enjoy and which so many will find informative, inspirational and essential to their lives. A piece of chamber music you could happily never hear again? There is no piece of chamber music that I would never like to hear again. There are always new ways of interpreting and presenting music. Sometimes we can be shocked, stimulated or even stunned by the ways that chamber music can be performed. Let me give you a case in point. Earlier this year in Leipzig at the Moritzbastei Club, where I direct the series ‘KLASSIK underground’, we presented the music of Dmitri Shostakovich’s String Quartets for Fritz Lang’s classic movie M – a city looking for a murderer. Fritz Lang’s masterpiece deals with the consequences of inflammatory media coverage, criminality as well as moral questions about the justice system and vigilantism. It really is as relevant today as ever. When the original version of the 1931 film was released, as a cost-saving measure, there was an absence of music. This provided musicians of the Gewandhaus Orchestra – including myself – with the opportunity to offer an entirely new interpretation of Fritz Lang’s M, and possibly a new interpretation of Shostakovich. The combination of the film’s expressionistic scenography with the string quartets of Shostakovich enabled the audience to have an entirely new experience of chamber music, even though some may never have wanted to hear Shostakovich’s chamber music again. And so what one thought one never wanted to hear again could become a source of renewed interest. What’s the most embarrassing thing that could (or has) happened to you playing chamber music? I’d rather not answer this one! The classical composer you would most like to play chamber music with and why? Definitely Beethoven. Although I’m not sure which would pose a greater challenge – his inability to hear the other players or his fiery temperament and stubbornness! I think Beethoven’s string quartets are one of, if not the greatest, artistic and intellectual achievements in the repertoire for that genre. The Australian World Orchestra’s Chamber 8 tours Australia July 24 – 31. Playing of a première ordre from Simone Young and the AWO. Ahead of AWO Chamber 8’s Australian tour, the bassoonist shares his favourite things about chamber music. Ahead of Chamber 8’s Australian tour, the violinist shares some little-known gems from the chamber music repertoire. Messiaen biographer Peter Hill explains the personal pain behind the pivotal work in the French composer’s career. Ahead of Chamber 8’s Australian tour, the violinist shares the classical music clichés that annoy him the most. Ahead of Chamber 8’s Australian tour, the LA Philharmonic horn player shares his greatest on-stage fear.